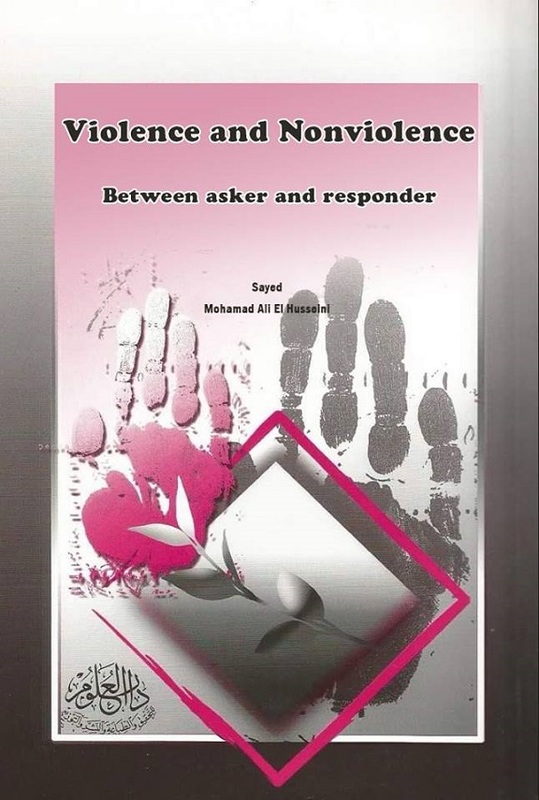 • الموضوع : Violence and Nonviolence: Questions and Answers ” peacemaker” cleric Mohamad Ali El-Husseini . The book titled: “Violence and Nonviolence: Questions and Answers” contains answers by His Eminence Mohamed Ali El-Husseini regarding the position of Islam on the following issues: violence and its notion, does Shariah condone violence, what is the concept of terrorism, how does it relate to Jihad, what is the relationship between oppression, dictatorship, political suppression and violence? Etc. In Lebanon, following the end of the war and while the team was working on a report about the war and its outcomes, I parted ways with them to follow up on a story that had caught my interest in observing the impacts of war. I saw the Shiite Muslim cleric Mohammed Ali El-Husseini on TV where he was talking in an amazing way about how he refused war, violence and acts of terrorism. Along the Tyre-South Lebanon road, he was distributing copies of his book titled: “Violence and Nonviolence: Questions and Answers” written in Arabic and English. Afterwards, Fadi Abi Allam, President of Permanent Peace Movement, who was also a fellow member of Mennonite Central Committee, arranged a meeting with the Shiite Muslim cleric Mohamed Ali El-Husseini and he was quite enthusiastic to meeting him. I went together with Fadi and his friend Sonia to meet Mr. El-Husseini in a hotel in Beirut since his home and office were bombed during the Israeli aggression against the Southern Suburb of Beirut and sustained damages. During the meeting, cleric Mohamed Ali El-Husseini was wearing black cloak and turban, the ideal attire of any Shiite Muslim cleric. He greeted us and presented copies of his book and started explaining to us his believes with regards to peace and how peace can be made and materialized on the ground. He also talked about how to stay away from violence. Cleric El-Husseini’s book cites sayings of Mahatma Gandhi and Martin Otherking Jr. He also talked about Jesus, his antiviolence movement and his outlook of life. In his book, Cleric El-Husseini discusses how peace and nonviolence are related to Islam and how the latter promotes them, as well as how Islam does not justify violence. El-Husseini says: “There is no doubt that nonviolence is the effective solution for various crises and peace can never be spread except through communication, discussion and dialogue and by creating harmony and rapport among human beings”. I left the meeting optimistic because of the fact that I had been lucky and honored by meeting a courageous peacemaker in a country suffering from war. At the end, I would like to say that in light of the tensions and instability prevailing across our region, which is poised for even further seditions such as sectarian seditions, we have to encourage influential scholars and intellectuals like cleric Mohamed Ali El-Husseini who promote peace. He experienced war, devastation and acts of violence and his house and office had been bombed, yet he made TV appearances encouraging people, inviting them to peace and asking them to shun violence and fighting. He endeavored with diligence and honestly to spread peace and love and to cultivate a culture of tolerance, forgiveness and nonviolence. That is indeed a great humanitarian undertaking by a courageous Muslim man who’s filled with opinions and narratives of an authoritative figure who dedicated his time and effort for the purpose of peacemaking. The reason that compelled me to introduce Cleric El-Husseini was not to promote him as a person as I don’t promote persons and he himself wouldn’t accept that. But I found him a model for peace and that he is able to present a civilized image of Islam and Muslims due to his place in Lebanon, which remains to be in the global spotlight at least for this period. I therefore made an attempt to introduce him in order to support his project since he told me that he has been nominated for this year’s Nobel Prize for Peace. I wish him best of luck. I wish that likes of Mr. Mohamed Ali El-Husseini who strive to spread peace would have the luck necessary for them to accomplish their duty as best as possible. This would enable them to contribute effectively in making the world hear our voice and know that our Islam and our religious figures promote peace and are peacemakers.